The government is introducing the Good and Services Tax (GST). Soon, our cost of living will go up, inflation, decreasing spending power and ultimately the poor become poorer. Bleak days are ahead, right? Well no. For one thing, the price of goods and services will not rise up as much as 6 percent as claimed. (Considering the rate of GST is set at 6 percent). This is a general perception towards GST and yet not enough explanation given to allay the fear of this confounding simple logic. It should be countered that GST will eliminate the cascading and compounding effect of Sales and Services Tax (SST). Currently the SST is charged at every level of production, thus raising the final price of the product. In other words, it’s a double taxation. For example, a shirt that costs RM10 for the fabric material will be taxed 10% (sales tax) to the garment manufacturer. That would be RM11. The garment manufacturer then turns the fabric into a shirt (production cost RM40) valued at RM51 to sell to the supermarket. At this stage, the tax paid by the supermarket is 10% of RM51 which bring the total cost of the shirt to RM56.10. Applying the profit margin of RM20, the supermarket would sell the shirt at RM76.10. When you buy this shirt, the sales tax you paid would be RM7.61. 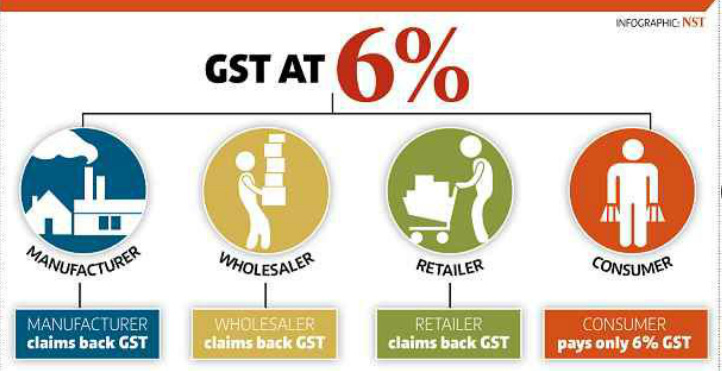 Now, under the GST, the 6% will only be taxed to the final consumer as the manufacturer and the retailer can claim a rebate since they are not the final consumer like you. So the RM10 shirt will now be sold at RM70 and the consumer then would pay a GST of RM4.20 which is lower than the tax paid under SST regime. One wonder since the tax collected by the government is much lower than the current SST system, why GST is being introduced? How can the GST increase the revenue for the government? This will be made possible because the GST will be more broad-based and more points of collection. As more people to become affluent and well-off, government income from GST will increase in tandem. Some might say GST is a tax on everything. Well they are partly true. However, slight modification has been made in which GST will be implemented with zero-rated items for necessities. You will pay no tax for rice, vegetables, budu, belacan, public transportation, property, financial and education. In brief, the GST is a fairer system for the tax is not based on income but spending. Therefore it taxes those who can afford to spend. Because it is the wealthy who will generally consume more, the GST is automatically taxes them most, not the lower income group. Unless the lower and middle income group spend like the rich income earner, the GST will not make their life suffer. If the government doesn’t widen the tax base, there is no room to cut income taxes further. With GST, personal income tax and corporate tax will be greatly reduced for the simple reason: government doesn’t have to rely on their income. So you have more disposable income to spend. Isn’t that what everyone wants? After all, lower corporate tax will attract more investment. If Malaysia wants to catch up with highly competitive countries like Hong Kong, Taiwan, South Korea and Singapore, surely the GST must be introduced so that the current high corporate tax can be more attractive. 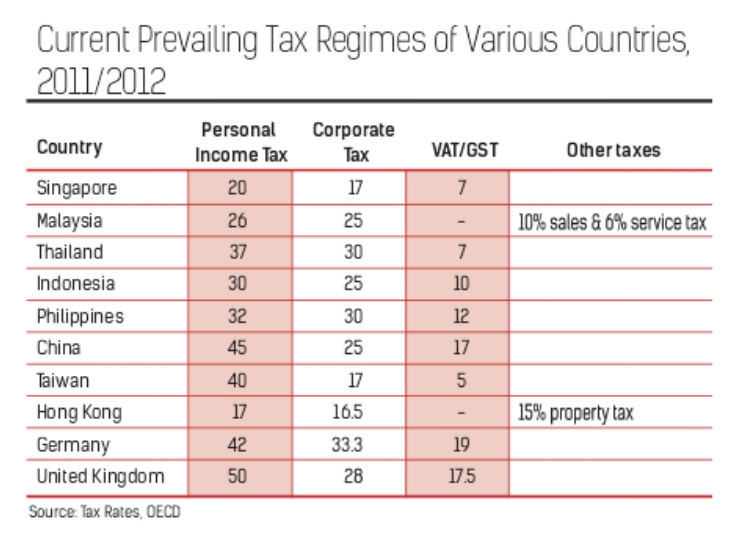 Obviously for a heavily-subsidised country like Malaysia, we depend too much on income tax. It is totally unfair for the 1.9 million taxpayers to continue ‘paying’ for the rest of citizens so that they could enjoy the same standard of living ie fuel subsidy, affordable healthcare and first-class infrastructures? However, we cannot afford to tax more people as you and I know that Malaysians are not that generous especially to the government. Therefore, GST is the only way to get more cents. And it does make sense too..